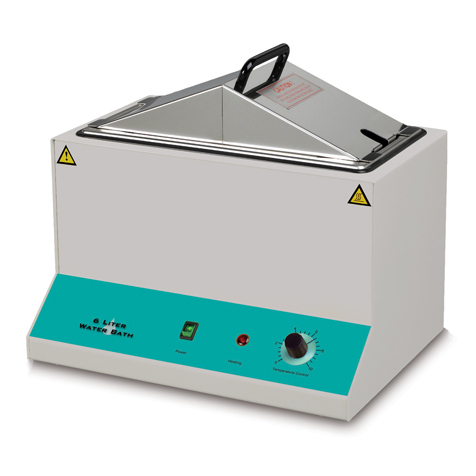 The mini water bath provides 550W of heating power and is equipped with a pilot light to indicate heating mode. Accurate temperature stability is maintained by a hydraulic thermostat. The stainless steel, seamless chamber is easy to clean and provides a worry-free service life. The water bath comes complete with a stainless steel gable cover to retain heat and minimize evaporation. A magnetic stainless steel clip is provided for suspending a thermometer from any location around the perimeter of the water bath. This bath accomodates plastic test tube racks and up to three 250mL Erlenmeyer flasks.